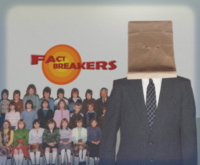 Although it's barely remembered now, one of the boldest attempts to marry education with entertainment was the '70s BBC TV children's programme Fact Breakers. 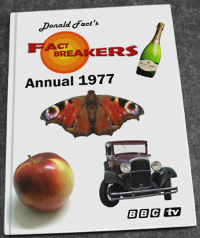 Hosted by the legendary Donald Fact, the man behind the popular 'It's a Fact' column in IPC Magazines' Chuckles comic, the programme was a mixture of filmed reports and studio items exploring the fantastic world of facts. From nature to technology, astronomy to geography, all manner of facts were presented to the nation's children. Many viewers who grew up in the '70s will fondly remember that Donald would round off each episode with a tap dance routine or a trumpet solo, despite the painful truth that the factmaster had zero aptitude in either discipline and usually terminated his performance early by twisting his ankle, swallowing the mouthpiece or, on one memorable occasion, spraining his lip. What made these light entertainment outbursts even more unlikely was the knowledge that Donald Fact was extremely uncomfortable in front of the camera and much preferred to remain behind the scenes. He presented the first four episodes of series one from off-camera, shouting random facts to a bemused and often tearful audience of 7 - 14 year-olds. Things didn't improve much for the remaining programmes, which he hosted whilst wearing a bag over his head - the reason for which was never explained, but which became the subject of much speculation in playgrounds up and down the country. It came as a great surprise, therefore, when the show was recommissioned the following year, although from the start it was obvious that its days were numbered. For this series the producers had introduced a new feature, 'Donald Fact's Fact Chimney'. This item was introduced by Donald saying 'Let's see what we can stuff up the Fact Chimney this week,' a catchphrase which mysteriously failed to catch on. 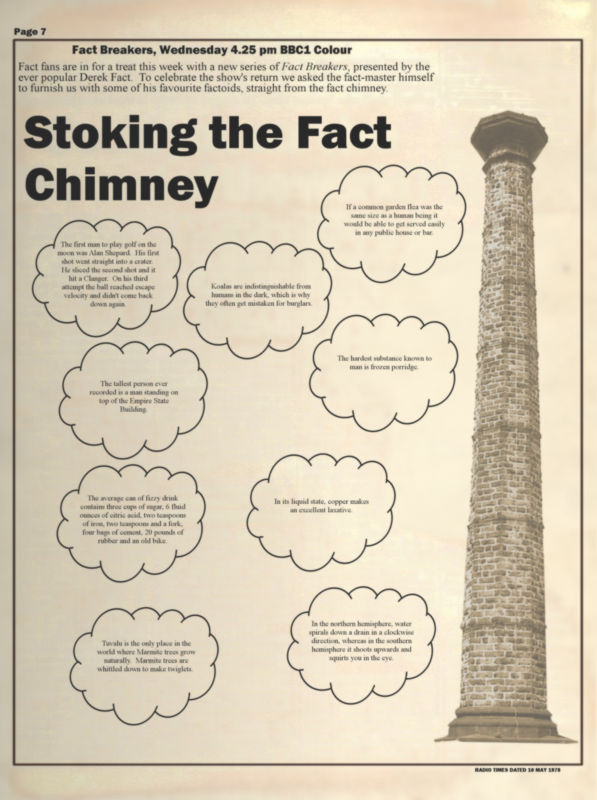 Donald would then take a random object - an apple, a bicycle or a brick, for example - and feed it into the 'Fact Chimney', a large and unconvincing plywood prop. 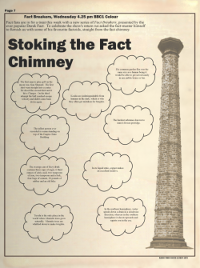 Thanks to a combination of dry ice and a primitive video effect, a number of film clips demonstrating facts about that week's object would appear out of the top of the chimney. All this was perfectly harmless until show four when Donald, having had an allergic reaction to nine pints of bitter that he had medicated himself with during lunch, decided to stuff a live goat up the chimney. This unscripted and unexpected turn of events caused a great deal of consternation in the studio control room, some considerable alarm amongst the audience and, at the very least, mild distress for the goat. The show was taken off air. The BBC apologised profusely and reassured the public that no goats had been harmed. This announcement proved to be less than reassuring when the Daily Mirror revealed that the goat was dead, although this was apparently due to an unrelated incident on the set of Blue Peter. It was the end of Donald Fact's TV career, although the fact-Kaiser himself didn't seem to mind one bit and happily went back to editing his column in Chuckles. Interestingly, fact fans note that his post-Fact Breakers output tended to concentrate more heavily on livestock. Fact Breakers itself was briefly revived in 1989, presented by Kriss Akabusi and the woman from Dollar. This time they wisely avoided the fact chimney feature but the show was never able to fully shake off the spectre of 'goatgate' and was pulled after just three episodes. As for Donald Fact himself, he was killed by a cheetah - the fastest land animal on Earth, with a recorded top speed of over 70 mph. I've told you this before, of course, but I like it and it didn't get much of a reaction last time, so nuts to you. Despite being cancelled partway through its second series, the show spawned its own board game. 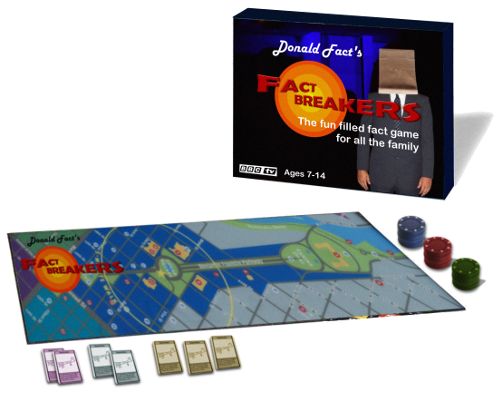 According to Donald Fact himself, writing in his autobiography, the game holds the record for being the worst selling TV tie-in game of all time. Second hand copies can be found fairly easily, but few come complete with the original paper bag. Traditional Oompah music under threat.